This leaf is from a Flemish psalter of the mid-thirteenth century and measures 13 x 9.5 cm. 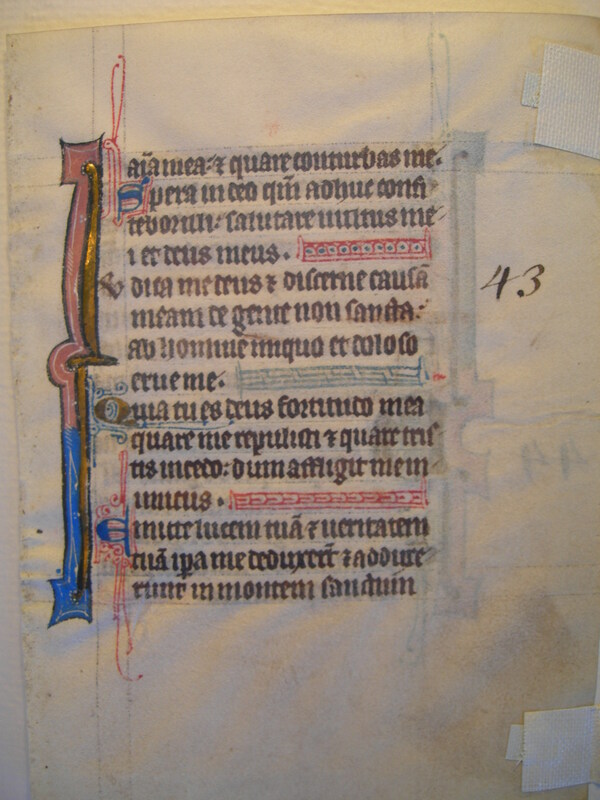 It is lined in ink; the primary textual ink is dark brown, with decoration in red, coral, and two shades of blue. The initial letter of each psalm is illuminated, as are the first letters of every other verse, and the beginnings of the Psalms are marked with prominent Arabic numerals in ink. The discrepancy in numbering the Psalms is caused by varying textual divisions in the Hebrew and Greek versions. See Denison University Leaf 20 for more information about this manuscript. 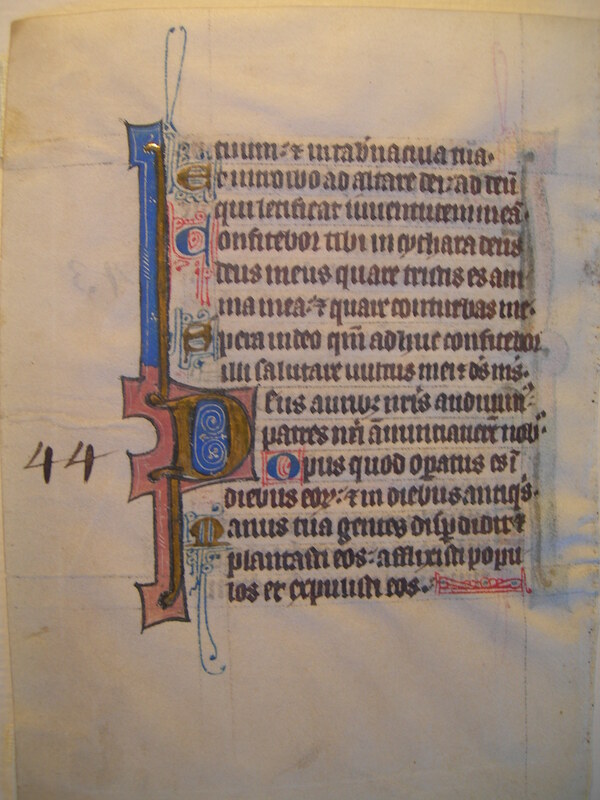 Text: Psalms 41:12 and 42:1-3 (recto); Psalms 42:3-5 and 43:1-3 (verso). Reconstruction Note! In Ege's original manuscript, this leaf followed what is now Leaf 20 in the University of Colorado, Boulder portfolio. ánima mea? et quare contúrbas me? Spera in Deo, quóniam adhuc confitébor illi, salutáre vultus mei, et Deus meus. 43 Iúdica me, Deus, et discérne causam meam de gente non sancta: ab hómine iníquo et dolóso érue me. Quia tu es, Deus, fortitúdo mea: quare me repulísti? et quare tristis incédo, dum afflígit me inimícus? ...O my soul? and why dost thou disquiet me? Hope thou in God, for I will still give praise to him: the salvation of my countenance, and my God. tuum, et in tabernácula tua. Et introíbo ad altáre Dei, ad Deum qui lætíficat juventútem meam. Confitébor tibi in cíthara, Deus, Deus meus. Quare tristis es, ánima mea? et quare contúrbas me? 44 Deus, áuribus nostris audívimus, patres nostri annuntiavérunt nobis, opus quod operátus es in diébus eórum, et in diébus antíquis. Manus tua gentes dispérdidit, et plantásti eos; afflixísti pópulos, et expulísti eos. 3 Send forth thy light and thy truth: they have conducted me, and brought me unto thy holy hill, and into thy tabernacles. 4 And I will go in to the altar of God: to God who giveth joy to my youth. 5 To thee, O God my God, I will give praise upon the harp: why art thou sad, O my soul? and why dost thou disquiet me? Hope in God, for I will still give praise to him: the salvation of my countenance, and my God. 2 We have heard, O God, with our ears: our fathers have declared to us, The work, thou hast wrought in their days, and in the days of old. 3 Thy hand destroyed the Gentiles, and thou plantedst them: thou didst afflict the people and cast them out.